Track ore types to immediately respond to ore type changes. Ensure proper grind and proper treatment prescription. Use these parameters to determine characteristics for ore types that can be monitored real-time. Monitor product ore types to ensure proper product blend and to minimize potential dilution. Actual data for the ore tracking from a copper mine. The rock feed % is reported by the mine. The Split-Online camera was configured for the particular rock type A. 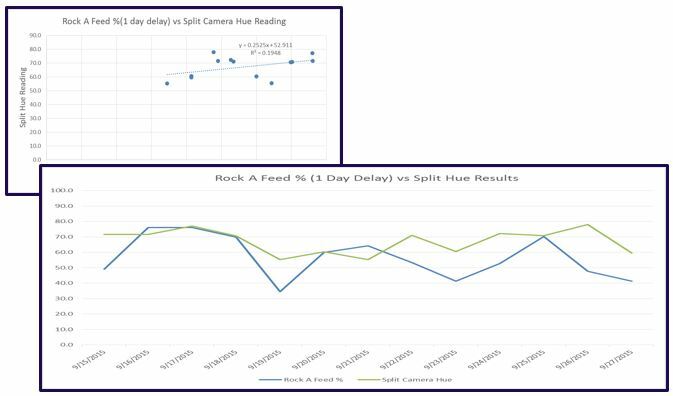 The correlation shows the system detected the rock a day later as it was drawn from the stockpile to feed the mill.